It’s always more fun writing in a group. The camaraderie, the coffee, the small talk between exercises – and then there’s the tickling urgency of the clock. But something more is shared. Crumbs. Oxygen. Time. And you get to know people through listening to them read out their writing. Shyly, confidently, sadly, bitterly, laughingly, passionately. I get the feeling that despite sitting at a round table covered in waffly paper, tostadas and cafe con leches vying for space with sprawling notebooks, in fact we are on a boat, each one of us dipping our hand into the water as we speed along, feeling the cool liquid slip over our fingertips, sifting out seaweed, bits of fishing wire, perhaps even a fish. 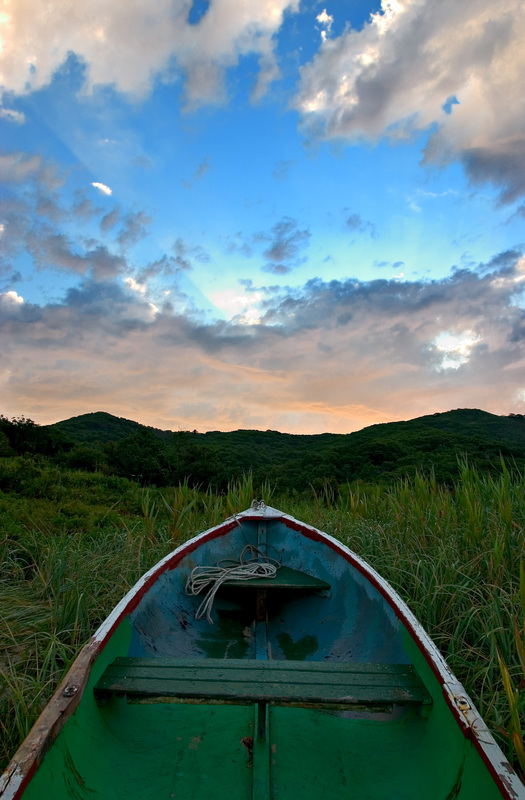 Rumi once said: ‘In a boat down a fast-moving creek, it seems that the reeds are moving by. What seems to be changing around us is actually the speed of our craft leaving this world.’ With his words in mind, here are a few creative writing exercises to get your outboard motor spluttering into action, so that you and your writing can get out into the open sea. For this exercise you will need to invite yourself to someone’s house, let off a small remote-controlled firecracker or similar distracting device on their front lawn so they leave you alone in their kitchen for five minutes, and quickly open all the doors in their pantry, fridge, freezer, oven and write down twenty items of food. Now, when you need inspiration to kickstart your writing, pick a word at random (it can help to write them on separate pieces of paper and pick them out of a hat). Let the smells rush through your nostrils, the tastes enliven your mouth, the image remind you of that Thai restaurant, your university days, an English summer day watching the cricket…(don’t forget to pick up your pen at this point). Take two short pieces of your own writing or extracts copied from a book. With a coloured pen, underline all of the adjectives in both pieces. (You might want to use different colours for each one.) Now rewrite one of the extracts, substituting an adjective from the other piece for each highlighted adjective you come to. The more different the styles of each piece, the more peculiar and funny the exercise will be. Cut out pictures of people from Sunday newspaper supplements (usually more real and interesting than magazine faces). Keep them in a folder somewhere. When stuck for a character, take out the wad of pictures and one will jump out at you (try not to pee your pants when it does). Pick a piece of your own bad writing, the worst you can find. Now swap it with a friend’s worst bit of writing, and each of you rewrite the other’s piece, changing it as much as you like. Having something concrete to hack to pieces, without fear of offending, is a great starting point when you’re lost for words. Brainstorm all the styles of writing you can think of – comedy, horror, romance, fantasy, period drama, chick lit, tabloid, magic realism, futuristic and so on. Write them down on separate pieces of paper and fold each one up. Now write down possible scenarios, such as: child buying sweets from a shop, a teenage girl telling her parents she’s pregnant; a man running over a dog in his car; a politician accidentally using a swearword live on camera; a boat sinking; a couple arguing, and so on. Write each of these down on other bits of paper and fold them up. Now close your eyes, have a rummage, and take one of each. Write the scene in the genre. Each person writes a title for their neighbour’s mini-story (one page or so). Make a list of, say, ten proverbs, quotes or hackneyed statements. (Try http://quotes.dictionary.com, or http://www.phrases.org.uk if you get stuck.) Now choose one at a time and create a scene that illustrates the statement without mentioning it explicitly. Each person begins with a strip of paper. At the top they write something – anything, song lyrics, a strange image, a bit of speech, whatever. The more abstract, or the harder it is to draw, the better. Now everyone passes the paper to their neighbour, who draws what you’ve written. They now fold over your writing and pass it on to their neighbour, who writes what they’ve drawn. Continue thus, folding over the last-but-one contribution each time. Feel free to fall off the sofa laughing, shrieking with absurd glee and spurting your beverage out through your nose as you see the wildest creatures ever created in Biro evolve from the primordial soup of your communal imaginations. With that, dear writing readers, I leave you to your beckoning pens, hoping they will moonlight for you as oars. This entry was posted in Funny, Thoughts, Writing and tagged creative writing, exercises, friendship, fun, sailing by cavemum. Bookmark the permalink. i’ve had a post-natal writing block and this post is really encouraging to the ink flow in my keyboard veins so thank you. oh and i adore your stuff. you write beautifully. Thankyou Snomad! It is hard enough getting your head together after giving birth let alone finding the time to sit down and write so I applaud your perseverance! I will keep adding to it in the comments section whenever I come up with/hear of anything new – it would also be great for other writers to share their own favourites. Happy scribbling! If you want to start a new story but have no idea where to begin, try looking through psychology and neuroscience books – even the tired old ones in second hand shops, usually on peculiar syndromes you’ve never heard of before. In these books you will invariably find bizarre case studies that will kick-start your imagination. Have a look at The Man Who Mistake His Wife for a Hat by Oliver Sacks if you don’t believe me, which proves that life really is much stranger than fiction. If you are that way inclined, you can also trawl through Homeopathy, Aromatherapy, Bach Flower Remedy or other holistic medicine books for vivid depictions of emotional states and surprisingly spot-on, quirky characters. Believe it or not there is a homeopathic type who, when ill, likes playing piano, and another – whose remedy is made from cuttlefish ink – who writes. The most simple, refreshing, creativity-fostering exercise of all. Go outside, wherever you may be, in the countryside, a forest, a huge, thrumming city, a quaint village, the seaside…and without opening your notebook, just sit and watch. What can you see, hear, smell, taste, feel? What stands out at you? Look for details, then zoom out and get a sense of the whole. Could you describe the feeling of this place using nothing more than a few neat references? A seagull eating a chip thrown up by a kid, a man carrying a clear plastic bucket decorated with a crab, narrow jettied houses in stick-of-rock colours, blackboards chalked up with offers of lobsters, amusements arcades bleeping, the grease of battered plaice heavy in the h=belly…once you’ve got something you feel like recording, open your notebook and begin. Here are a few more I’m planning on using soon…I’ll let you know how they go. Draw around your hand, making shapes with it if you feel like it. Now fill in the shape with words, whatever springs to mind. Each person is allocated (or chooses) a letter of the alphabet, could be at random. Now you begin a game of consequences, each person adding a word (or phrase) to the previous person’s addition, but they can only use words beginning with their letter. Alternatively, all start with A, then go on to B and so on. Anything to restrict the possibilities and force you to find new and surprising ones. Take an emotion, say, anger, hope, unease, estrangement, love, grief, relief, sadness, jealousy…Now give it a three-dimensional shape. Can you hold it in your hand? Or is it a house you can walk through? Is it a landscape? How big/small is it? Is it hot, cold, spiky, jelly-like, itchy, hairy, smooth? Close your eyes and feel it as if it had a physical form, then describe it in as much detail as possible. Update: we tried the word trade and found that the best way to do it was to use the words you’d gained (good, bad and ugly) to create a new piece. The challenge was to include them all, and like any restriction the results were fabulous, weird, wonderful and fresh. Make It Tangible produced an instant poem for each of us! I brought along some cut flowers to last week’s session, and we all sat quietly with our choice for a moment before writing what we felt it might be for (medicinally, emotionally etc). Then we did a character sketch of the kind of person that might need this flower if it were made into a remedy. Tomorrow’s session might include ‘Ghosts of My Past’, in which you turn a memory – say, your childhood house, your dress sense circa 1988, your teenage fear of being told off by a teacher – into a character, fleshing it out as if it were a real being. I’ll tell you how it goes!